History: (Marvel Universe Millennial Visions 2001 - "Thunderbolts: Give a Guy a Break" (fb) - BTS) - Back when he was still an outlaw, Hawkeye went toe-to-toe with Iron Man. He eventually ended up fighting alongside Iron Man instead of against him, leading him to believe that everyone deserved a second chance. (Marvel Universe Millennial Visions 2001 - "Thunderbolts: Give a Guy a Break" (fb) - BTS) - After the original team of Thunderbolts revolted against Baron Zemo, Hawkeye met up with them and eventually became the team leader, helping guide them in the heroic direction. 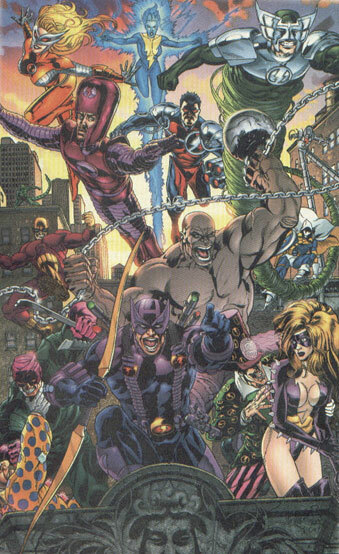 Once Hawkeye had finished converting the original team, he set his sights on a new team of villains to transform into heroes, starting first with the Wrecker and Whirlwind. When the two refused to become heroes, Hawkeye got the help of Maynard Tibold, the Ringmaster. Hawkeye then had the Ringmaster hypnotize the villains into becoming heroes, figuring that losers like Stilt-Man were not going to amount to anything, and that villains didn't really deserve free will anyways. 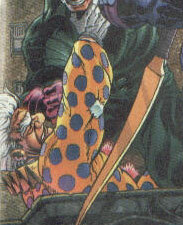 (Marvel Universe Millennial Visions 2001 - "Thunderbolts: Give a Guy a Break") - Hawkeye led a team of villains-turned-heroes into action, all the while thinking to himself about how there seemed to be bad news in the future, as Ringmaster kept trying to make Titania his love slave and the Clown kept getting on everyone's nerves. Hawkeye also thought that the Ringmaster might at some point decide to turn the team into his own using his hypnotic hat. Comments:Created by Bill Rosemann and Pablo Raimondi. 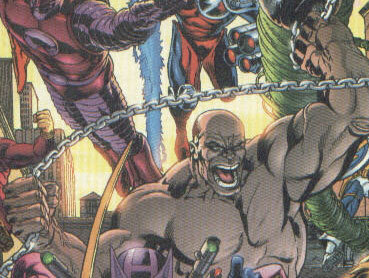 Absorbing Man was the same as his Earth-616 counterpart up until Hawkeye had the Ringmaster hypnotize him into becoming a hero. 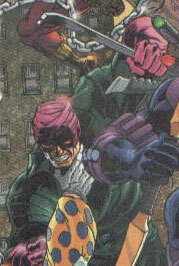 --Marvel Universe Millennial Visions 2001 - "Thunderbolts: Give a Guy a Break"
Batroc was the same as his Earth-616 counterpart up until Hawkeye had the Ringmaster "rehabilate" him. Once he joined Hawkeye's Thunderbolts, he really began to bother Hawkeye. 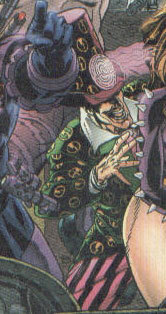 The Clown was the same as his Earth-616 counterpart until Hawkeye had the Ringmaster "convince" him to join the Thunderbolts. Fixer was essentially the same as his Earth-616 counterpart and remained with Hawkeye's Thunderbolts even after the hypnotized villains joined up. 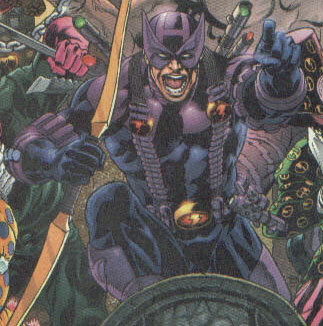 Hawkeye was the same as his Earth-616 counterpart up until he decided that since he had rehabilated villains as the Thunderbolts, that he would set out to do so for other villains. When some of the villains refused to become heroes, Hawkeye used the Ringmaster's hypnotic talents to "convince" the villains to turn over a new leaf and join his Thunderbolts. 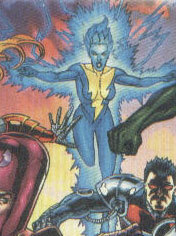 Jolt was the same as her Earth-616 counterpart and remained with the Thunderbolts even after Hawkeye began hypnotizing villains into joining them. 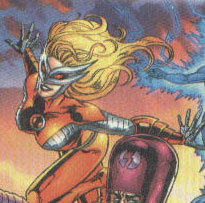 Moonstone was the same as her Earth-616 counterpart and decided to remain with Hawkeye and the Thunderbolts, even after he began brainwashing villains to become heroes. Maynard Tibold was pretty much the same as his Earth-616 counterpart up until Hawkeye asked him to use his talents to "rehabilate" villains into becoming heroes and members of the Thunderbolts. Once the Ringmaster hypnotized a small army of villains, he began trying to force Titania to love him, leading Hawkeye to question how long it was going to be before the Ringmaster attempted to take over the team. Scorpion was the same as his Earth-616 counterpart up until he was hypnotized by the Ringmaster into joining Hawkeye's Thunderbolts. 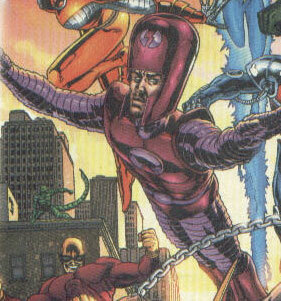 Stilt-Man was the same as his Earth-616 counterpart up until Hawkeye began brainwashing villains into joining the Thunderbolts as heroes. 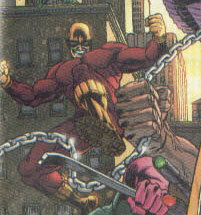 Stilt-Man was one of the first villains sought out by Hawkeye, as Hawkeye felt that Stilt-Man would never amount to anything anyway and that he might as well use his talents for good. 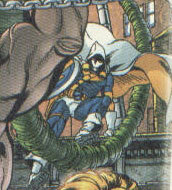 Taskmaster was the same as his Earth-616 counterpart up until he was brainwashed into becoming a hero under Hawkeye's Thunderbolts. Titania was the same as her Earth-616 counterpart up until she was brainwashed into serving in Hawkeye's Thunderbolts. Once she was on the team, the Ringmaster began a scheme to turn her into his love slave. 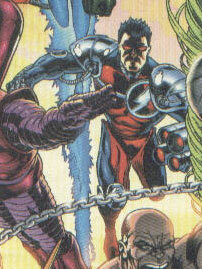 Whirlwind was the same as his Earth-616 counterpart up until Hawkeye approached him to join the Thunderbolts and reform. When Whirlwind refused, Hawkeye had him brainwashed into serving. 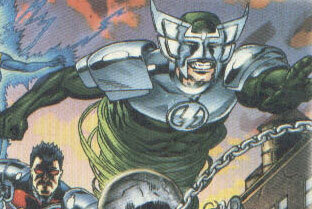 Wizard was the same as his Earth-616 counterpart up until he was hypnotized into serving in Hawkeye's Thunderbolts. 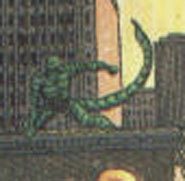 Wrecker was the same as his Earth-616 counterpart up until Hawkeye approached him to join the Thunderbolts. When the Wrecker refused, Hawkeye had the Ringmaster hypnotize the Wrecker into becoming a hero.